I'm not a vegetarian, but I know quite a few, even a few vegans. I won't give up meat because I like it too much, but I understand and respect the reasons that others have. and the personal health concerns (many meats are high in saturated fats and, depending on how they're raised, lack "good" fats like omega 3), to name a few of the big ones. I think a lot of meat eaters purposefully shroud themselves in ignorance to avoid thinking about these things. They do so at their folly. While I haven't eliminated meat from my diet, the aforementioned concerns have led me to make changes in the last 10 years. 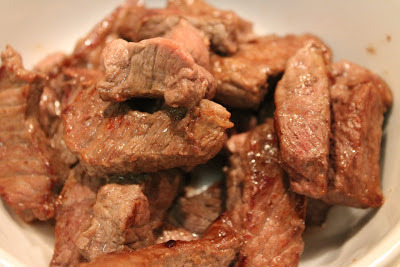 Beef is something I make rarely, rather than regularly (my blog was 8 months old before I posted its first beef recipe). We only buy naturally raised poultry--the kind that has normal proportions rather than those bred and fed to have breasts so unnaturally large it's hard to imagine the animals were ever able to walk. We don't buy meat raised with hormones or antibiotics. Yes, these decisions mean that our meat costs more, a choice not everyone can afford to make. However, if economics meant I had to choose between questionably raised meat or switching to more vegetables, I'd take the latter. As society becomes more aware of the problems with how we're raising meat, I hope affordable alternatives become more common. Because my "classics" month was rather meat-heavy, this week I'm going vegetarian, something the Washington Post Food section did recently in honor of its editor Joe Yonan who "came out" as vegetarian, a bold step for such a high-profile food professional. The Post actually features rather prominently this week, having advised me on the recipe for Pasta Primavera with Asparagus Pesto and it's the source for the Multi-Grain Risotto with Broccolini and Brussels Sprouts recipe (which they got from Mintwood Place, one of my favorite D.C. restaurants). I'm also going to offer a Shaved Asparagus Salad and a refreshing cocktail that I think would go well with any of these dishes. 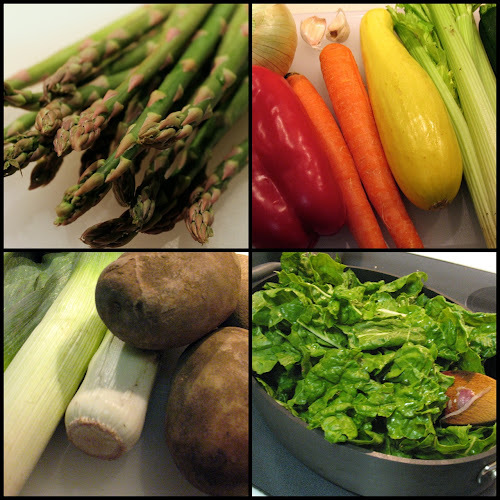 April through September is a good time to up the percentage of your diet made up of fresh fruits and vegetables. This is when local fresh vegetables become plentiful at farmers markets, and even at conventional grocery stores you'll find fewer foreign lands on the little produce origin stickers. Asparagus is out now, signaling the start of spring. Peas, green onions, green garlic and berries will be on their way soon. Then comes summer with its glorious bounty and my absolute favorite: ripe tomatoes. Nothing beats them. I'm getting excited just thinking about it. I explored classic dishes by notable chefs: A Beef Stew by Jacques Pepin, Bolognese Lasagna from a recipe by Marcella Hazan, and a Spice-Brined Roast Chicken inspired by local Palena chef Frank Ruta. None of these are fast dishes; they all took hours to make (and 2 days in the case of the chicken), but they are all good examples of the value of time in developing flavors. The hours were well worth it. I looked for ways to update two once popular dishes that have fallen out of vogue: Fish Almondine, which I made with grouper, styled after a dish recently served at Poste, and Beef Stroganoff, which I tried to take back to its simpler Russian and French roots, as well as push forward with a mashed potato base inspired by Range. The almondine may fade into history, but the stroganoff was quite tasty. I updated three classic salads with fresher, lighter ingredients: a Smoky Waldorf Salad with a vinaigrette dressing, Cobb Salad with honey-smoked almonds instead of bacon, and a Wilted Spinach and Bacon Salad that uses warm ingredients instead of hot bacon fat to wilt the greens. I had one week focused on bacon as a classic versatile ingredient for salad (aforementioned Wilted Spinach Salad, soup (Smoky Pinto Bean with Red Wine and Sweet Potato), pasta (Smoky Trofie with Mushrooms), risotto (Bacon-Mushroom Risotto) and a cocktail (an Old Fashioned made with bacon-infused bourbon). One the great things about bacon is how much flavor it can impart to a dish, even in small quantities. 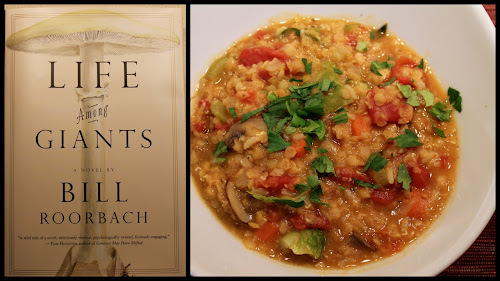 For a vegetarian dish, I made a Red Lentil Stew with unusual inspiration: it's based on the dish a main character makes in the novel Life Among Giants by Bill Roorbach. In addition to the bacon Old Fashioned, other cocktails for the month included the Gin Tonic, Spain's sophisticated update of the class G&T, the Singapore Sling, an old drink that really shines with quality ingredients (no sour mix) and the resurgent use of shrub in cocktails (specifically grapefruit). 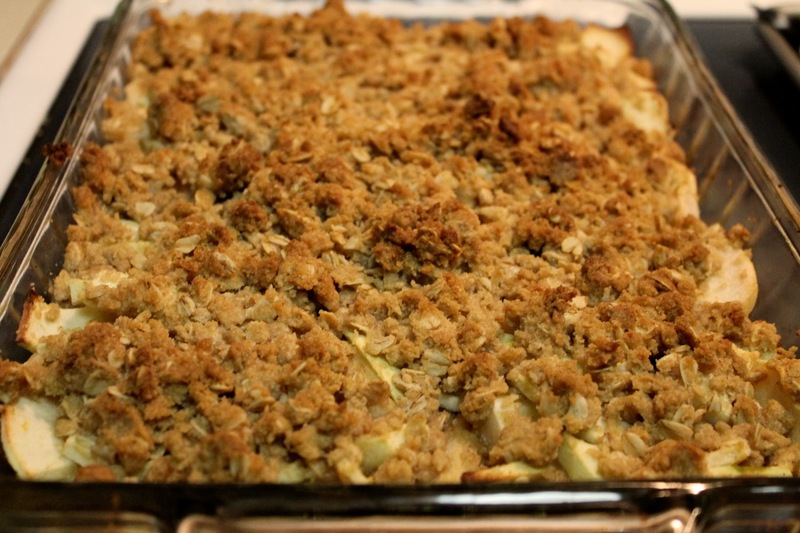 For dessert, I included a simple classic that never goes out of style: Apple-Pear Crisp. Although it feels at home in the fall, it's good any time of year. 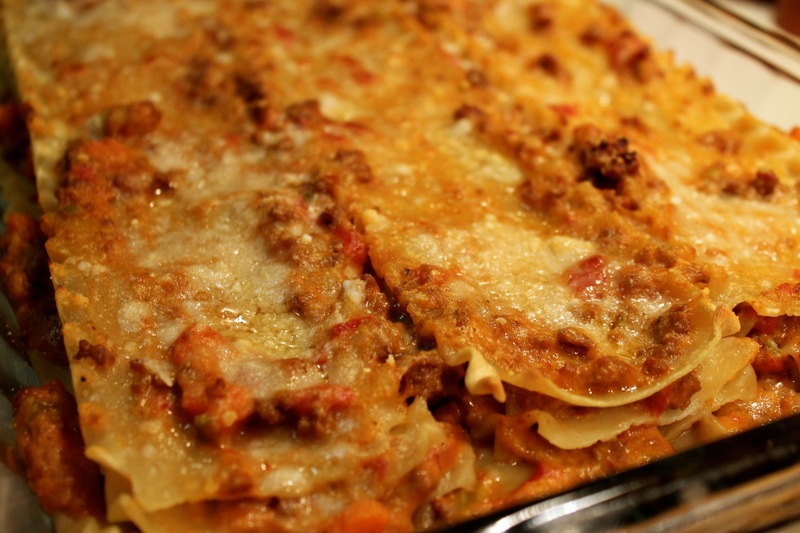 One of the great things about lasagna is how versatile it is. Last summer, I made a lasagna with seasonal vegetables, and at some point I hope to share with you my favorite fall version with roasted butternut squash, sage and goat cheese. The version of lasagna most Americans know is the Italian-American one made with meat-tomato sauce and lots of cheese--ricotta, mozzarella and parmesan. Wanting to discover a more traditionally Italian method of making the dish, I went searching for a recipe by Marcella Hazan, widely credited as one of the foremost authorities on traditional Italian cooking. I wished I'd had the foresight to just buy her cookbook, Essentials of Classic Italian Cooking, which I did pick up recently but not until after making the lasagna. Had I done so, I might have used homemade spinach noodles instead of the dried store-bought variety, which she says may save time but "you will be sadly shortchanged by the results." Er...sorry Ms. Hazan. Just don't use the "no boil" type, which I've not had good luck with unless the sauce is pretty thin, since they need the moisture to work right. Regardless of how it could have been with homemade pasta, this lasagna was really quite good. Hazan's lasagna uses a bolognese sauce, which is like the meat-tomato Americans are familiar with but richer and made with more vegetables. Tomatoes are a component, rather than dominant. Instead of ricotta, the layers of pasta are spread with a thick béchamel. There's still plenty of parmesan, and I didn't miss the mozzarella. The steps for making the béchamel were different than what I'm used to. Normally, when I make béchamel for mac & cheese, I add the milk all at once and whisk it with the butter and flour until it's thick. 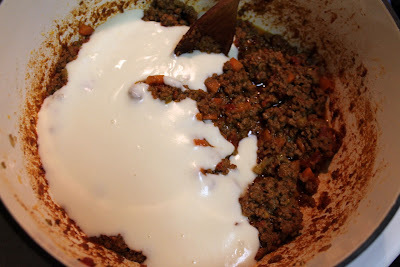 Here, the milk is added and whisked in gradually, which at first makes dough, but eventually with all the milk added makes a thick, rich sauce with the consistency of sour cream. Carefully apportion your ingredients when you're ready to layer them. You don't want to run out of sauce before all the noodle layers are down. 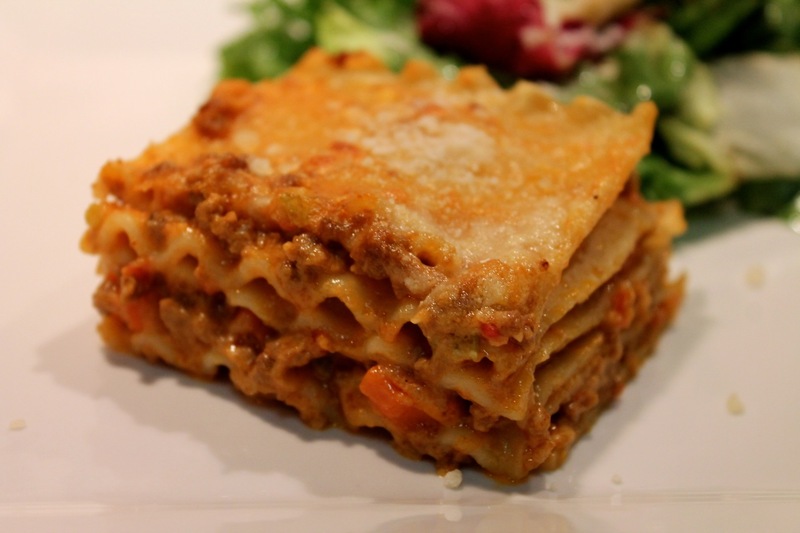 Like many dishes that have been around a very long time, the exact origin of lasagna is not clear, although it probably comes from ancient Greece. Of course back then, it wouldn't have had any tomatoes in it, since tomatoes are native to the Americas. I used half a can of Cento San Marzano peeled tomatoes, which are whole plum tomatoes canned in a thick tomato sauce. I froze the leftover tomatoes and sauce for later use. As discussed above, I used regular dried lasagna noodles instead of homemade spinach noodles. I used 1 lb. of ground beef instead of 3/4 lb. The original béchamel uses 3 cups of milk, 6 tbsp. of butter, 4 1/2 tbsp. flour and 1/4 tsp. salt. I used a little more parmesan at 1 cup than the 3/4 cup in the recipe. Hazan dots the lasagna with butter before baking it, which I omitted. 1. Heat a large sauté pan or Dutch oven over medium heat. Add butter and onion and cook until onion is translucent, about 5 minutes. Add celery and carrot and cook another 2 minutes. Add ground beef, salt and pepper to taste. Cook the beef until browned, breaking it up with a wooden spoon. 2. Add milk and simmer, stirring frequently until it has bubbled away completely (takes about 10-15 minutes). Stir in nutmeg. Add wine, simmer until evaporated (another 15 minutes or so), then add the tomatoes. When the mixture begins to bubble, turn the heat way down and cook uncovered at a very low simmer for 3 hours (yes this is a very long time, and even though the liquid will evaporate, the fat keeps this somewhat moist. That said, if it looks too dry, add a little water. Check it every 20 minutes or so). Don't proceed to the next steps until you're about 30 minutes from putting this in the oven, as the bechamel does not take long and you don't want it sitting around. 3. Preheat oven to 400 F with rack in second from top position (about 6 inches from top). 4. 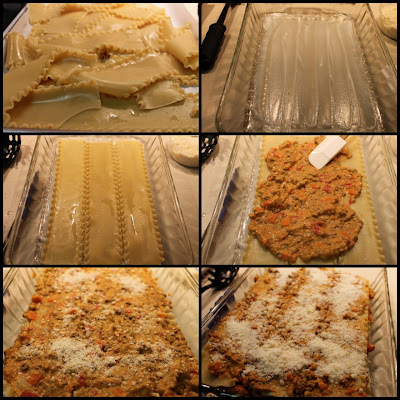 Cook lasagna noodles according to package directions. 5. Heat milk in medium saucepan over medium heat until almost boiling (alternatively, and to avoid dirtying yet another pot, heat it in the microwave in a glass measuring cup). 6. Heat butter in a heavy saucepan over medium-low heat. When melted, whisk in flour. Cook, stirring constantly for 2 minutes. Do not brown flour. Remove from heat. Add 2 tbsp. hot milk and whisk to incorporate. Continuing adding and whisking in milk in 2 tbsp. increments until half the milk is incorporated. Then add 1/2 cup at a time util all the milk is whisked in. 7. Place saucepan over low heat, add salt and cook stirring constantly until thickened (should be thick like sour cream). 8. Coat the bottom of a 9 X 13 baking dish with butter. Spread 1 tbsp. of bechamel over butter. Lay down a layer of noodles (with standard lasagna noodles, 3 laid the long way should be enough for one layer, so with 18 noodles, plan to make 6 layers; with homemade noodles, you may need to do some cutting, be sure not to overlap noodles within a layer). 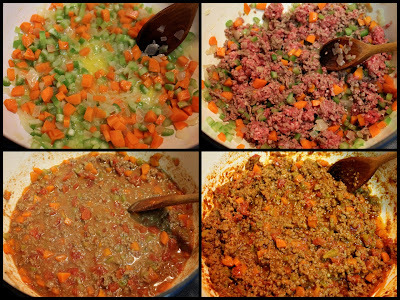 Combine bolognese with remaining bechamel. Spread a layer of sauce on the noodle layer (aim to use about 3/4 cup of sauce per layer). Spread about 2 tbsp. of Parmesan over sauce. Repeat layering (noodles, sauce, parmesan), finishing with the extra parmesan on top. Bake until bubbly on the sides and golden on top, about 15 minutes, maybe a little more. 9. Remove from oven and allow to cool for about 10 minutes. Cut into 12 squares and serve carefully to retain stacked shape. A friend of mine recently returned from a trip to Southeast Asia. To welcome him back, I made Singapore Slings, invented (in Singapore, appropriately) in 1915 by hotel bartender Ngiam Tong Boon. Washington Post spirits columnist Jason Wilson wrote a nice piece about the drink a couple years ago, so I won't rehash all the good history he covered, except to note that the drink most people call a Singapore Sling may have actually originated as the Straits Sling, with the original Singapore Sling being a far simpler drink of gin, cherry brandy, lemon juice and cherry. In writing about the drink in 2011, Jeff Burkhart calls the Slingapore Sling "a virtual mosaic of European colonialism," citing the British, Danish, French and German origins of its ingredients. He also recounts how the drink devolved to just gin, grenadine and sweet and sour mix by the 1980s, but its fresher form has enjoyed a revival with the current interest in mixology. 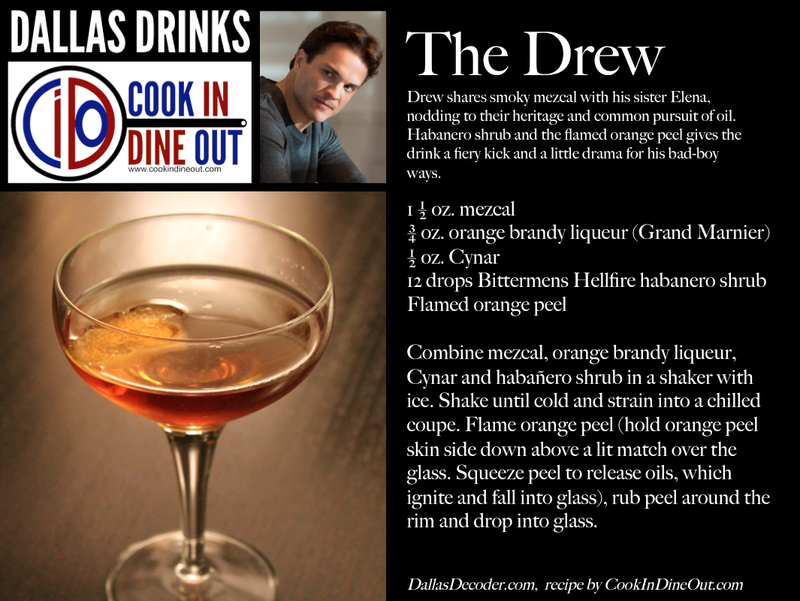 I like the recipe from PDT. This isn't as simple as the one Wilson identifies as the original version, but it has a nicely balanced list of fresh ingredients far better than what Burkhart saw in the 1980s. Combine all ingredients (except garnish) in a shaker with ice. Shake until cold and strain into a collins glass filled with ice. Garnish with a maraschino cherry and pineapple (the PDT recipe) or other combinations. The Post’s spirits columnist makes an effective case in favor of petite sirah (not "syrah"), an under appreciated California varietal that I happen to rather like. For California red lovers, it’s a nice diversion from cabernet or zinfandel. Although far less popular than other reds, many great wineries produce petite sirah. I recently drank a fine 2007 bottle of Chateau Montelena petite sirah to mark the recent passing of that winery’s founder, James Barrett. At $35, I wouldn’t recommend that as an entry to the grape, but Wilson rounds up six suggested bottles, most of which are under $20. A Nebraska consumer has filed suit against Parkay margarine producer ConAgra for falsely advertising the fat and calorie content of its spray butter alternative. Although the package states the product is fat free with “0 calories,” the suit claims an 8-ounce bottle contains 832 calories and 93 grams of fat. On the way hand, I think someone should put a stop to companies labeling high-fat foods as being “fat free.” On the other, I think consumers needs to exercise some common sense on this matter. Soybean oil, a well-known fat, is the second ingredient in the Parkay spray after water. This means the spray isn’t fat free. Period. Even more egregious than Parkay are the cooking oil sprays that claim to be fat free, since they are nearly 100% fat. The James Beard Award-nominated blog ushers in spring with a trout version of the classic French dish salmon with sorrel sauce. Perhaps most useful is Shaw’s method of blanching and shocking the sorrel to cook it while maintaining its bright green color. I was a picky eater as a kid. My parents sometimes talked about my specific aversion to anything red (except ketchup). Turns out such color pickiness isn’t that uncommon, as Clark relates that her 4-year-old daughter has a preference for white foods. Before the colorful bounty of spring arrives, she offers praise for these kid friendly pale foods, such as Chicken Potpie and Mac & Cheese. Lucky Peach: “Roast Chicken, 2034,” by Magnus Nilsson. It’s the year 2034. Industrial chicken has become so toxic that no one can eat it anymore, yet the yearn for a good roast chicken remains. What to do? Nilsson, working with Chris Ying, concocts the Frankenbird: strip the skin off a chicken, remove all its flesh, replace the flesh with equally sized pieces of pork loin, stitch the whole thing back up and roast it. Another bit of fun from Lucky Peach #6. If Beef Stroganoff could be the subject of a biographical film, it would be a grand epic, spanning decades, continents and wars. It would have its moments of tragedy, a little infidelity (bear with me on that one) and possibly a downer ending: Daily Meal included it on its recent list of 11 dishes disappearing from restaurant menus. Sirloin is a tender, lean cut good for Beef Stroganoff because the dish is not cooked long. Be careful not to overcook it, or it will become tough. Like the Grouper Almondine, I wanted to explore whether Beef Stroganoff is worthy of a new chapter. My impression of the dish is that it is not haute cuisine: chunks of beef mixed with sour cream and served over noodles sounds rather dowdy frankly. But when I looked into its background, I learned that it has a surprisingly rich history. Sirloin, cut into 2-inch strips prior to searing. The dish emerged in Russia during the 19th century and is likely named for Russian statesman Count Pavel Alexandrovich Stroganov, as was the fashion to name a dish after the household it was created for. Sources say the exact origins of the dish are unconfirmed. Some point to French chef Charles Briére, who was working in St. Petersburg and submitted it for publication in L’Art Culinaire in 1891. Other sources indicate the dish was in the Stroganov family for some time and appeared in the 1861 Russian cookbook A Gift to Young Housewives by Elena Ivanovna Molokhovets. Regardless, I like to imagine this is the sort of thing Anna Karenina would have sat down to eat at dinner. After the subsequent fall of the Russian aristocracy, the dish traveled to China, where it was popular in restaurants and hotels prior to World War II. Immigrants and American military personnel stationed abroad brought the dish back to the United States, where its popularity grew and peaked during the 1950s, ironic considering this was also the height of the Cold War. This is also when the once elegant dish became troubled. High costs of meat during the war sent cooks in search of cheaper, lesser quality cuts. American home cooks looking for shortcuts turned to the burgeoning processed food industry, leading to recipes for Beef Stroganoff that included ingredients like cream of mushroom soup and ketchup. Anna Karenina would not have been happy. 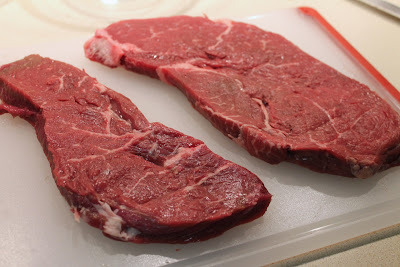 Because the meat will be heated again, it does not need to be fully cooked during the searing step. For my take on the dish, I wanted the honor the dish’s history, taking it back to a more traditional form. I was intrigued by its French origins. 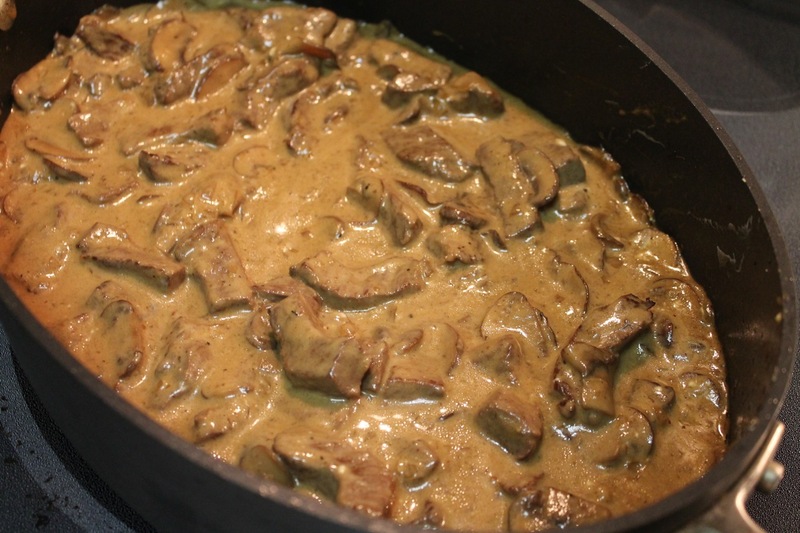 Blogger Jennifer Eremeeva (from Dividing My Time; she now writes Russia Lite and The Moscovore) describes Beef Stroganoff as an adaptation of beef fricassee and offers a good traditional recipe. For my dish, I turned to the definitive American voice on French cuisine for ideas. 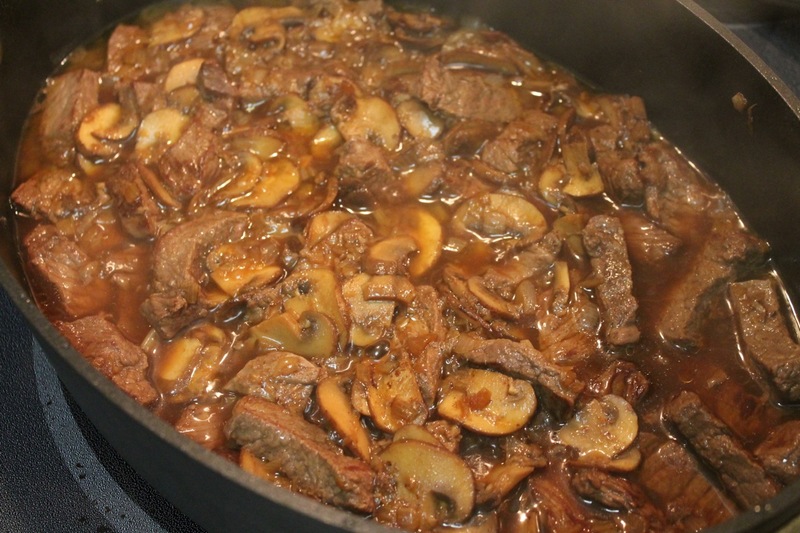 In Mastering the Art of French Cooking, Julia Child describes Sauté de Boeuf à la Parisienne as a French version of Beef Stroganoff. Perfect! The recipe’s simplicity is what drew me to it to use as the blueprint for my dish. Although her book is notorious for its hours-long recipes, this one is surprisingly quick—she claims it can be done in 30 minutes. And it uses just 12 ingredients, including salt and pepper. I also used elements of the recipe by America’s Test Kitchen, which is always a useful source for good technique. Instead of flour or cornstarch, I thickened the sauce with arrowroot powder which is less cloudy and has little flavor. Although commonly served in the United States with noodles, sources I reviewed indicated that the original Russian version would have been served over fried potato straws (see, I told you there was infidelity in this story). 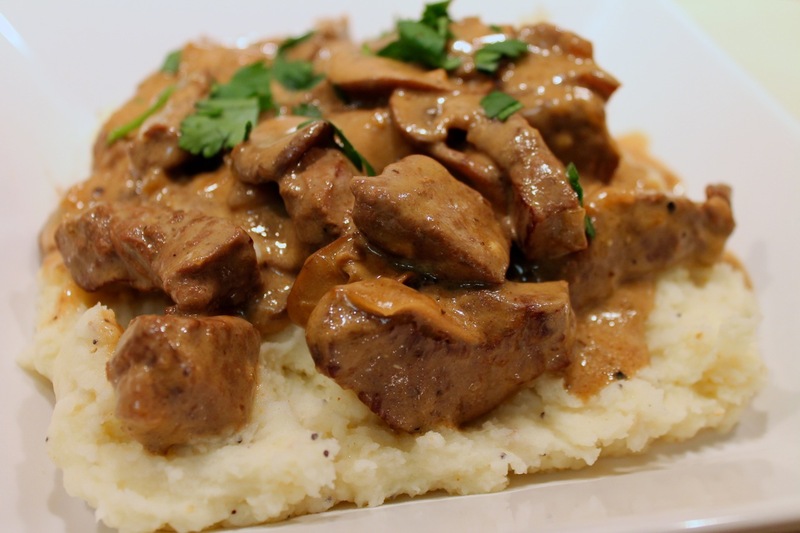 For my dish, I wanted to reunite Stroganoff with its original partner, although I chose mashed potatoes (and a modern take on mashed potatoes at that). 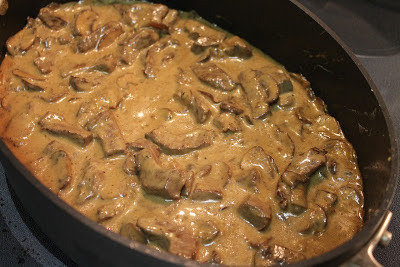 I am grateful to sources Beef Stroganoff.Net, Christine’s Pantry, Jennifer Eremeeva, WikiBooks and Wikipedia for the historical information presented here. 1 ½ lb. sirloin steak, pounded to ½ inch thickness and cut into strips 2 inches long by ½ inch wide. 2 tsp. arrowroot powder mixed with 2 tsp. waster. 1. Heat 1 tbsp. butter in a large skillet over medium-high heat. Sear beef in batches 2-3 minutes per side, turning once, about 4-6 minutes total. Repeat until all the meat is browned. 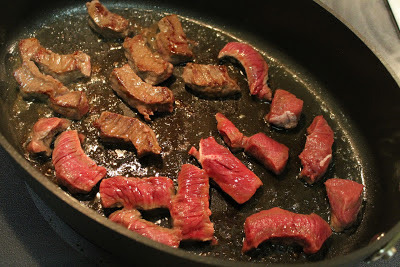 Remove meat from pan and set aside. 2. Melt 1 tbsp. butter to skillet. When foaming subsides, add mushrooms, season with seasoned salt to taste, and sauté for about 3 minutes. 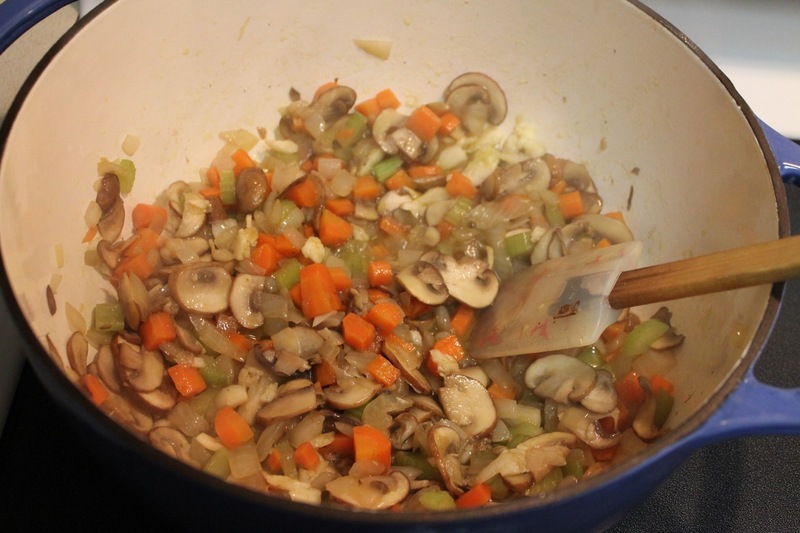 Add shallots and continue cooking until mushrooms and shallots are browned, about 6-7 minutes total. Remove from pan. 3. Deglaze pan with madeira, stirring to remove any remaining browned bits. Add beef broth, increase high and bring to a boil. Boil liquid until reduced by half. Reduce to medium. Return beef and mushroom mixture to pan, reduce heat and simmer, covered, until the meat is cooked but still tender, about 12-15 minutes. During the last couple minutes of cooking, add the arrowroot-water mixture and stir to thicken the sauce as it cooks. Turn heat to low. Season with fresh-ground black pepper and, if desired, additional seasoned salt. Stir in the sour cream. When heated through, turn off the heat. Serve over mashed potatoes topped with fresh chopped Italian parsley. We recently had Everything Mashed Potatoes as a side dish at Range, and I thought they would make a more interesting accompaniment for Beef Stroganoff than plain mashed potatoes. Apparently I’m not the only one, as an online search turned up a number of recipes. Some people got lucky and found an “everything bagel” spice blend, but since I couldn’t, I had to come up with one (which I did by studying the ingredients list of the Everything Bagel at Whole Foods). Put potatoes in a large pot and fill with water until covered by 1 inch. Bring to boil and cook potatoes until easily pierced with a paring knife. Drain potatoes, allow them to cool a bit and pass through a potato ricer into a large bowl (when using a potato ricer, the potato skins should stay in the ricer). 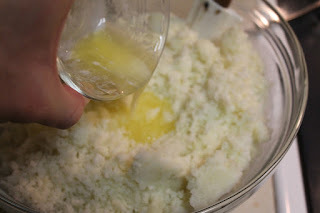 Add butter to potatoes and stir to combine. Add minced onion, minced garlic, sesame seeds, poppy seeds and seasoned salt. Heat milk in the microwave or in a saucepan over medium heat (if you do this on the stove, heat the milk while the potatoes are cooking). 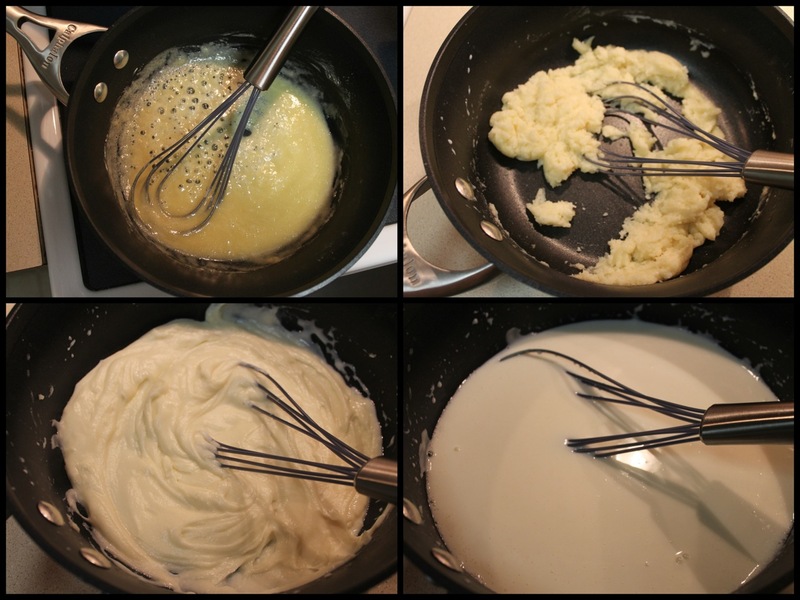 Pour milk over potato mixture, add sour cream and stir to combine thoroughly. I love a good apple pie, but when you don’t feel like making the dough, apple crisp is a simpler, just as satisfying alternative. Peeling and chopping the fruit is the most work. The crumble top is easy to mix together and, for novice bakers, a lot easier to get right than pie crust. You really can’t mess this up. The Washington Post Food section recommended this Easy Apple-Pear Crisp during a recent chat when I was looking for something easy to serve at a dinner party. 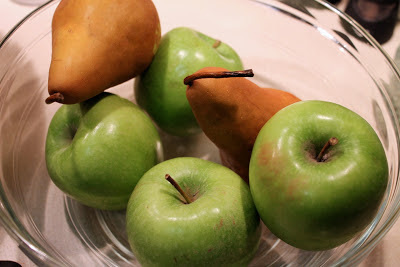 The combination of pears and apples was great. The crumble top was perfect. No downside here. 1. Preheat oven to 375 F with rack in middle position. Coat the inside of a 9-by-13-inch or similarly sized baking dish with butter. 2. In a large bowl, combine flour, sugar, oats, nuts (if using), salt and cinnamon. Add the butter and stir until it is evenly incorporated and the mixture forms clumps. Set aside. 3. In a large nonreactive bowl, toss together the apples, pears, zest, lemon juice and ginger. Add 1 cup of the crumb mixture and toss to combine. 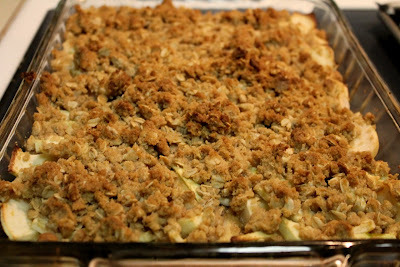 Spread the apple-pear mixture evenly in the baking dish. Sprinkle the remaining crumb mixture evenly over the top, using your fingertips to break up any large clumps. 4. Bake for 35 to 45 minutes until the top is well browned and the fruit is bubbly. Transfer the dish to a wire rack to cool. I served the crisp in bowls topped with fresh whipped cream. The crisp will keep refrigerated for several days. Cover with foil and reheat slowly in a low oven just until warmed. 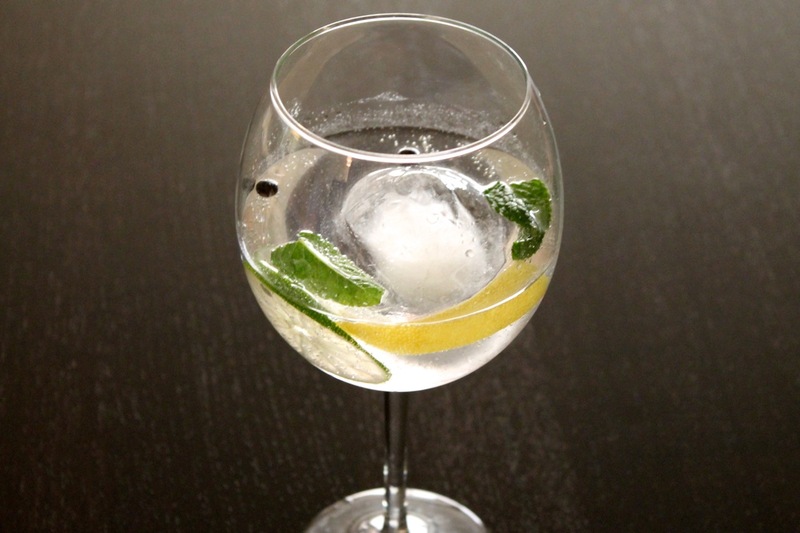 In The Feed, I recently wrote about an article examining how the classic gin & tonic has been reborn as the upscale "gin tonic" in Spain. I suppose this explains why Jaleo has such fabulous examples of the drink on its cocktail menu. Jose Andres's sangria sales will surely plummet when more people find out about the amazing gin tonics his bartenders are whipping up. 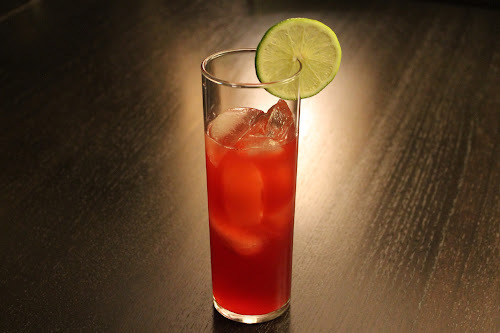 I found the recipe for this style of drink on The Latin Kitchen site. 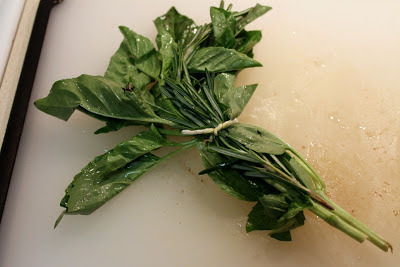 Place the mint leaf in a large wine glass and gently muddle to release its oils. Add ice cube. Squeeze lemon peel to release its oils and add to glass. Add juniper berries, lime wheel, gin and tonic to glass. Stir to combine and serve. 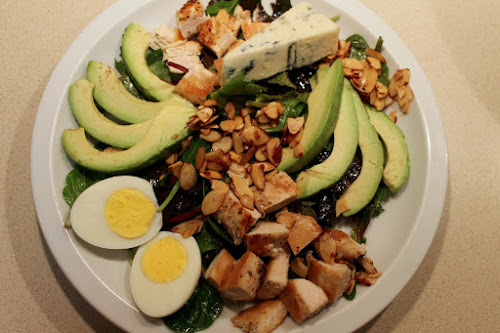 According to The Kitchen Project, the Cobb Salad was invented in 1937 at the Brown Derby restaurant in Hollywood by its owner Bob Cobb who, prowling for a snack, created a salad with what was on hand: lettuce, watercress, cold chicken, bacon, tomatoes, avocado, hard-boiled egg, cheese, chives and French dressing. It became very popular at the restaurant and has since become one of the most popular salads at restaurants everywhere. Perhaps owing to its long and somewhat buffet-like list of ingredients, it's a salad that easily open to interpretation--for better or worse. Because there are so many ingredients, it can become a dumping ground for lesser quality ones under the guise that such flaws will be "masked" by everything else. However, I think a salad made with a lot of bad ingredients does not make a good salad. Too many times I've had Cobb salad with bland lettuce, not enough vegetables and too many flavors competing for attention without harmonizing. In my opinion, a good Cobb Salad needs the freshest quality ingredients and a little editing. In that vein, there are a number of ingredients I could have included that do not appear here: tomatoes (not in season), olives, cucumber, onion and (gasp) bacon. Yes, I decided not to include the bacon. 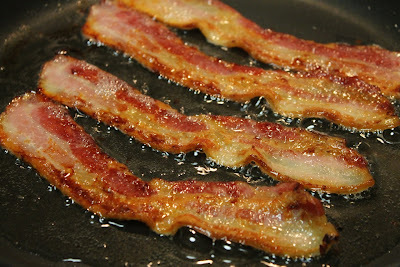 I do love bacon. After all, I just devoted a week of content to it. But I find it dominates the chicken too much in Cobb Salad. Instead, I've added my own twist: honey-smoked almonds. They provide a little crunch and smoke but with less assertiveness. 1. Heat 2 tbsp. olive oil in a medium frying pan over medium heat. Pat chicken dry with a paper towel and cook in the pan until cooked through and browned, about 10 minutes, turning halfway. Season with salt and pepper as they cook. 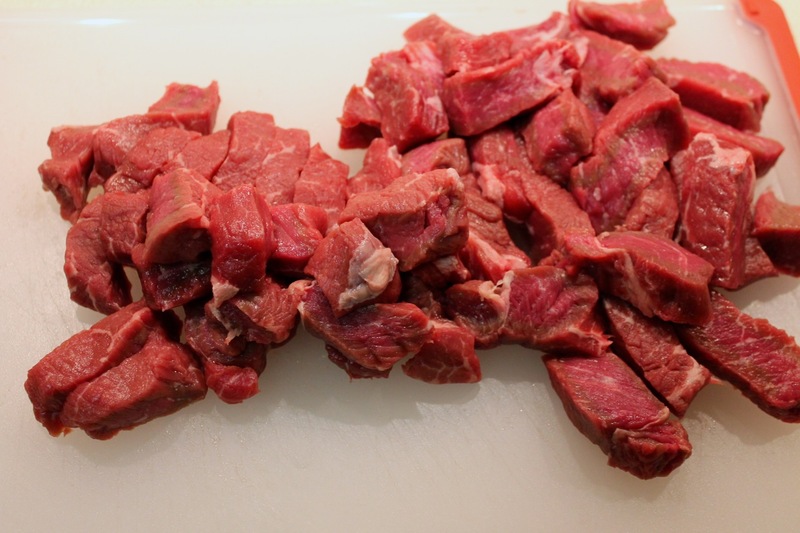 Remove from pan, allow to cool a bit and cut into cubes about 1/2 to 3/4 inch wide. 2. Add mixed greens to a large bowl. Whisk together remaining 2 tbsp. olive oil with vinegar and salt and pepper to taste in a small bowl. Pour dressing over greens and toss to coat greens. 3. Divide greens between two plates. 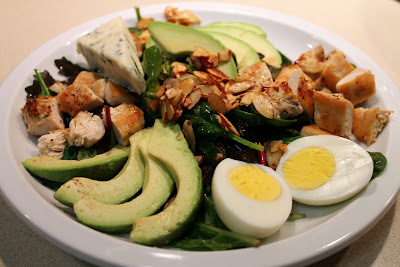 On top of greens, arrange cooked chicken, avocado, hard-cooked eggs, blue cheese and almonds. 1. Combine smoke flavor, honey and water in a small bowl. 2. 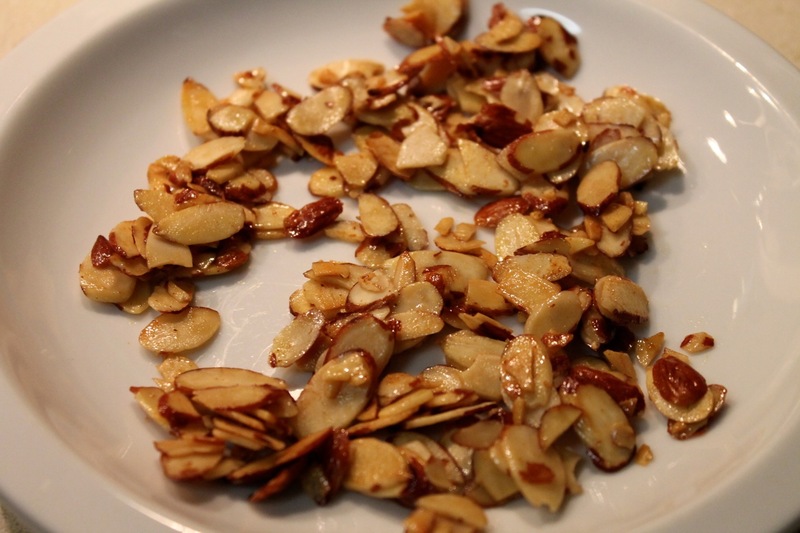 Toast almonds in a dry frying pan over medium-low heat until they start to turn lightly brown, about 5 minutes but watch closely to make sure they don't burn. Add the honey-smoke mixture and cook, stirring constantly, until the water has dissolved. Remove from pan and allow to cool on a plate (spread the nuts out evenly on the plate, otherwise as they cool the honey will bind them into nut clusters). Nominees for the coveted James Beard Foundation Awards were announced yesterday during a midday event in Charleston, S.C. The food industry’s biggest prizes will be awarded on May 3 for journalism, books and media and May 6 for restaurants. The link above includes the complete list of nominees in all categories. The Food section’s annual Beer Madness contest is back, this year with a local theme: all of the bracket entries are beers from Maryland, D.C., Virginia or Delaware, a really great idea to showcase our great local breweries. I was a little surprised not to see some of my favorites in the hop category, like Dogfish 60 Minute IPA (the 90 Minute version won Beer Madness a few years ago), DC Brau The Corruption IPA and Devil’s Backbone Eight Point IPA (all those breweries are represented in the contest, just with different beers). In addition to the bracket, the helpful Food team also included a style guide and glossary. Moss’s Salt Sugar Fat is an examination of how the junk food industry hooks consumers through marketing and careful formulation of the aforementioned three ingredients to achieve a taste “bliss point.” I’m reading the book right now and enjoying how Moss recounts the history of many of the developments that have led to the prominence of so-called convenience foods today. Mowbray mostly likes the book, although he says its pace can be “wearying.” I do like his line about how reading the book makes you realize “we’ve eaten like a nation of impulsive teenagers, happy to pay for a diet of carnival food.” A realization that may seem humorous but has rather serious implications. The healthy-minded food magazine profiles Dan Barber, chef and co-owner of Blue Hill in New York, which is nominated this year for the James Beard Award for Best Restaurant. He talks about how he came to love whole grains, even in desserts. Knowlton reacts to the ever-increasing trend of fat-laded dishes at restaurants in love with ingredients like pork belly, bone marrow and foie gras. After a week of bacon-themed dishes, I’d be a real hypocrite for suggesting we banish all things porky, but I do agree that there is excitement and then there is excess (and although I published all the bacon content in 1 week, I certainly didn’t eat all that within that time). To be fair though, one can chose not to order those dishes or patronize places without healthier alternatives. Photographing food can be challenging, which I’ve definitely learned over the past year of trying to make the food on my blog appear delectable. I cringe when I look at some of my early efforts and although I’ve learned a lot, I’m sure I still have a lot to learn. 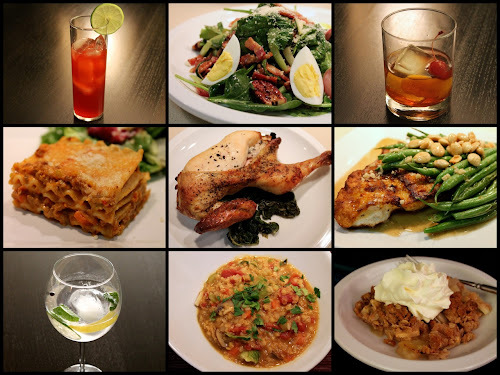 This gallery shows the importance of plating, staging and framing food for optimum appeal. 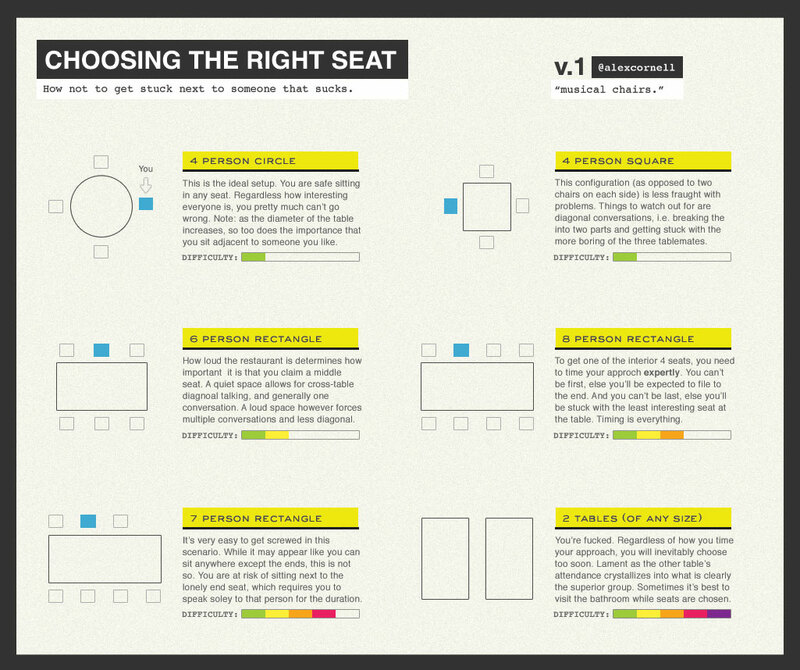 Designer Alex Cornell put together this amusing infographic to help diners make the best choice when faced by that important moment when your group arrives at a restaurant and where you sit can dictate whether the rest of the night is a success or a snooze. Beware of the 7-person rectangle and if you find your group sitting at side-by-side tables, you’re basically screwed (he used a more colorful metaphor). On its face, Bill Roorbach’s Life Among Giants looks like a mystery novel, but its depth of story and character is beyond that of typical genre fiction. Yes, the murder of teenage narrator David Hockmeyer’s parents sets the story in motion, but there’s more going on than David and his sister Kate’s decades-long quest to find out what precipitated their parents’ untimely demise. It’s also a story about how curiosity with fame, greed and lust entangle the lives of a seemingly ordinary middle class family with those of the internationally famous ballet dancer and her rock star husband who live across the pond in the “High Side” compound. It’s a book with a loving embrace of a wide range of misfit characters—the unnaturally tall football jock with a knack for creative endeavors; his tennis pro sister haunted by mental illness; a gay, tattooed chef and his vivacious transgender lover. It’s about how time alone cannot shake certain demons; they must be confronted. Bouquet garni with basil and rosemary. The perfect drinks, the perfect salads (down to perfect individual slices of radish, clearest memory, a bit of the red skin pulled into the white of the glistening core by the edge of a prep cook’s knife). And the perfect sandwiches, so neatly made on white toast, perfect, perfect, and served with perfect china-lavender ramekins of house-made mayonnaise, tiny spreading knives plated in gold. It was really, really good food, unforgettable down to the last details, details I’d linger over for the rest of my life. So simple: pommes frites, those BLTs, tiny cups of lobster bisque. “Sherry,” my mother said, tasting the soup, that palate of hers. And the dessert. I’ve never since had chocolate cake like that, a celebration in itself where no celebration was possible. David adds the Brussels sprouts with the leaves cut away. A dish that particularly stands out in the novel is a lentil stew David makes while his sister Kate recounts her latest ruminations on the long-unsolved case of their parents’ deaths (see pp. 165-171). David’s steps in making the stew are so precisely recounted that I suspected Roorbach has actually made this, which he confirmed over Twitter is something he eats all the time in the fall. I think it sounds delicious and have attempted to create a recipe for it based on the book’s description. To fill in a few blanks, I turned to this Indian Red Lentil Stew from Healthful Pursuit. 1. Soak lentils in salted water for about 10 minutes. Drain and set aside until ready to use. 2. In a small, dry frying pan, toast cumin seed and red pepper flakes over medium-low heat until fragrant. Grind in a spice grinder (I use a coffee grinder repurposed for this) and set aside until ready to use. 3. Heat olive oil over medium heat in an enamel-covered dutch oven, large deep-sided skillet or other large soup pot. Add onions and sauté until softened, about 5 minutes. Add carrots and celery and cook another 5 minutes. 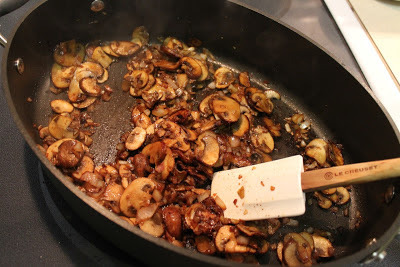 Add mushrooms and garlic, and cook about another 5 to 10 minutes until softened and the mushrooms start to brown. Add soaked lentils, ground spices, garlic, thyme, tomatoes, raisins, rice, bay leaf, bouquet garni and water. Season to taste with salt and fresh-ground black pepper. 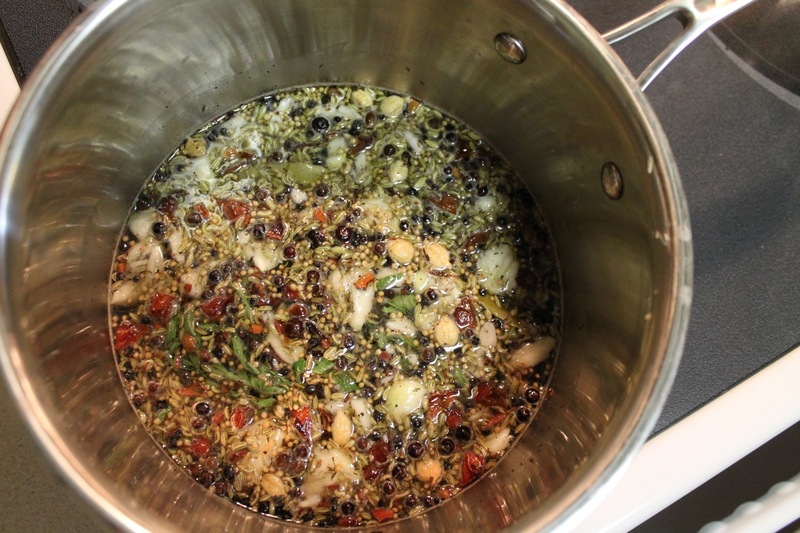 Bring mixture to a boil, cover, reduce heat and simmer for 15 minutes. 4. Uncover soup. 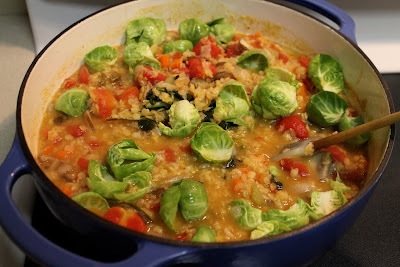 Add vermouth and Brussels sprout leaves. Simmer for an additional 8-10 minutes. Taste, adjust seasoning and serve topped with chopped celery leaves. Palena Café makes the best roast chicken in the country. Period. That’s a pretty big boast, but it’s true. 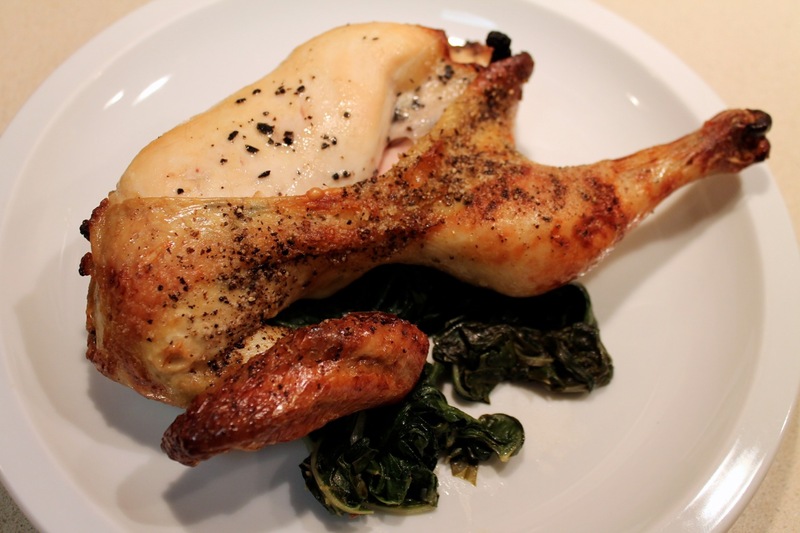 You might say, what about the chicken at Zuni Café? Yes, that is very good. Chris and I had it in San Francisco 2 years ago. I love their bread salad and I make that dish all the time. But when it comes to the chicken itself, Palena’s is superior. Okay okay, but certainly Palena’s chicken isn’t better than The NoMad’s, you’re thinking. It’s the talk of New York City with its luxurious under-skin stuffing of foie gras and truffles. Admittedly, keeping the chicken breast moist with foie gras is an interesting idea, and although we enjoyed it during our last New York trip, the whole time we kept talking about how it was good, but it wasn’t Palena. Chef Frank Ruta is just a genius with poultry. So what makes Palena’s chicken so special? That’s the question I wanted to answer with this dish, my attempt to make a Palena-esque chicken with juicy, flavorful brined flesh and crispy browned skin. Answering the question isn’t so easy, as Ruta has been secretive about his recipe. It’s not the one on Food & Wine, which sounds good but lacks the flavor complexity of the Palena chicken, which everyone assumes has been brined in a combination of herbs and spices. Last August, I asked Washington Post restaurant critic Tom Sietsema if he knew the secret. 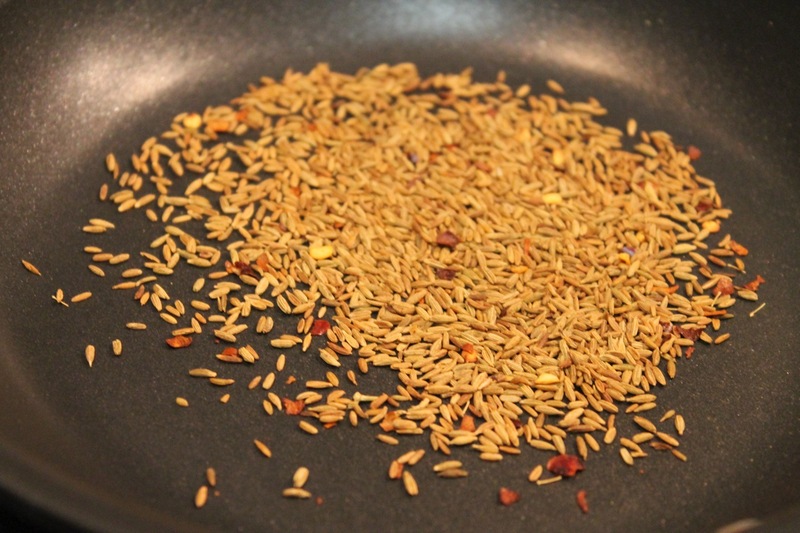 Sietsema went to the source who revealed that he brines a 2 ½ to 3 pound chicken in sweet spices and garlic with “more herbs in summer, more citrus in winter.” So I was partway there but not really sure what the “sweet spices” could be. Clove seemed liked a definite, maybe some cinnamon. Thankfully, I found this lively discussion on DonRockwell.com where members have had a years-long discussion trying to crack the Palena chicken code. From this, I got lots of good intel about the possible brine ingredients and techniques from which I based my recipe. Salting the brine was a bit of an issue. I needed enough for the brine to work, since the salt is what draws moisture from the chicken, which is then replaced by the salt-rich fluid in the brine. Since I’d used ½ cup of kosher salt to brine my Thanksgiving turkey breast, I figured 1/3 cup (specifically 2 oz.) would be sufficient for the smaller chicken. 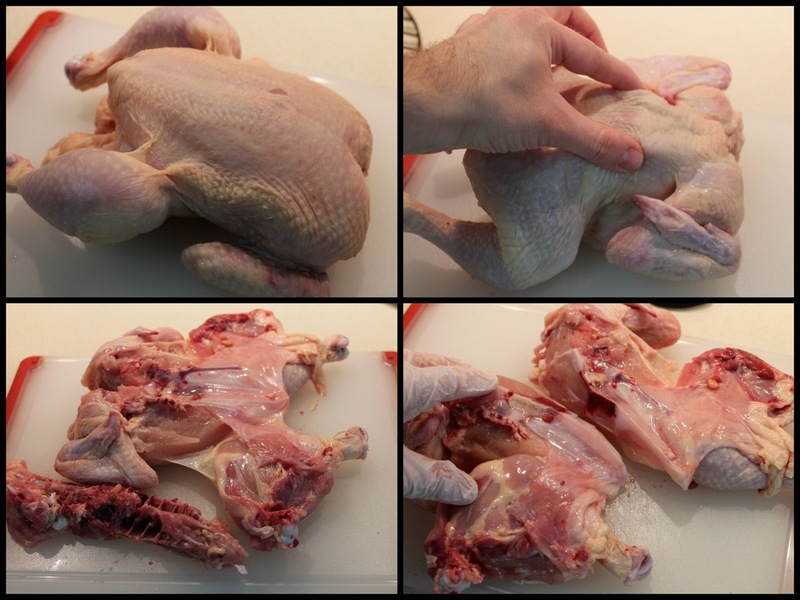 To cut the chicken in half, locate the backbone (between my fingers in the upper right), remove the backbone by cutting on either side with kitchen shears. Then cut down the middle of the breastbone. I’d never cut a whole chicken in half before, so I was grateful for this video that shows how to do it. I also cut the ribs out, since they were a bit sharp after I removed the backbone. After brining the chicken for 20 hours, I took it out of the brine, rinsed it, patted it dry with paper towels and placed it on a cooling rack set in a baking sheet that I would eventually use for roasting it and let it sit in the refrigerator for 6 hours. This is an important step for helping the skin brown: allowing it to air dry, since moist meat will cook but not brown well. As a final rich touch and a nod to The NoMad, I spread truffle butter between the skin and breast and drumstick meat. I used 2 oz., but I think 1 oz. would have sufficed, since a lot of this melted and dripped off. In their Science of Good Cooking cookbook by America’s Test Kitchen, the recipe for roast chicken discusses how putting the butter between the skin and the breast meat is preferable to putting it on the skin, since the moisture in the butter inhibits browning. Air dry the chicken in the refrigerator on a cooling rack set inside a baking sheet. I roasted the chicken in a hot oven, covering it with foil once the skin had browned sufficiently. I’d had a blowtorch on hand for finishing this, but it proved to not be necessary. Since Palena serves their chicken with lemon-braised greens (chicory and escarole according to the server last time I was there), I served mine over braised Swiss chard with lemon. 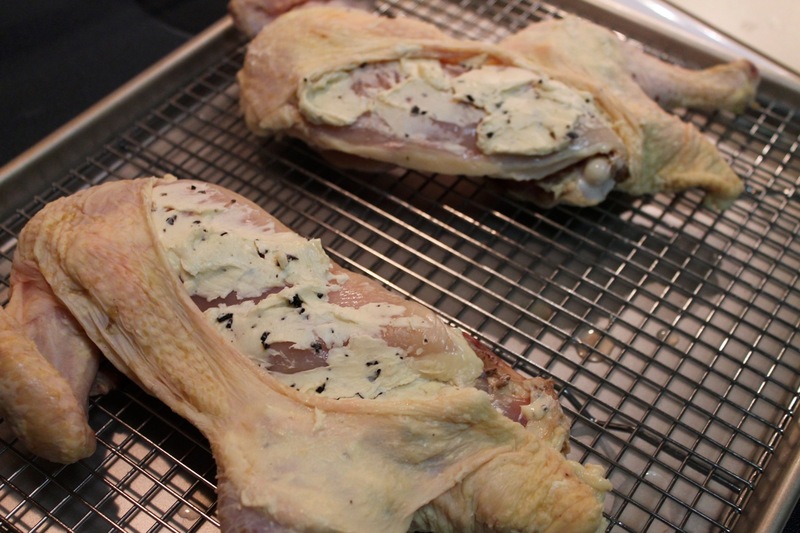 Use your fingers to gently separate the skin from the breast meat and coat it with truffle butter. I was generally please with how this turned out. The flavor was really good: rich and deliciously spicy not unlike what you get at Palena. The skin crisped nicely too. The only thing I wasn’t happy about was how the skin pulled back off the breast meat, probably a result of being cut and then shrinking as it cooked. However, since the breast meat was sufficiently juicy from the brine, this didn’t cause it to dry out. Overall, I’d say this was a definite score. If you’re a fan of Palena’s chicken, you might enjoy giving this a try. And if you’re not a fan of the chicken, you must not have had it yet. 1. 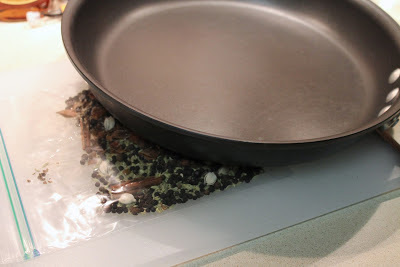 Combine cloves, cardamom pods, peppercorns, juniper berries, allspice berries, star anise, fennel seeds, cinnamon stick pieces and mustard seeds in a quart-size sealable plastic bag. Place on a flat surface and crush with the back of a large, heavy frying pan. Transfer coarsely crushed spices to a 4-quart saucepan. 2. 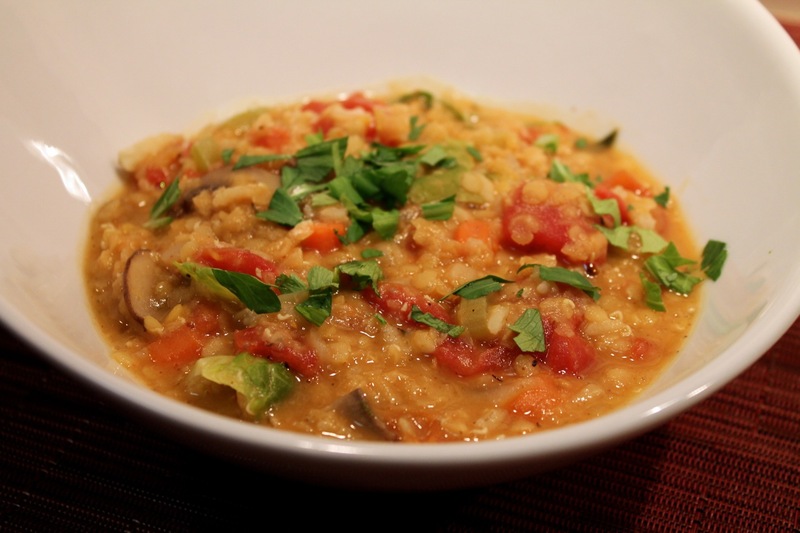 In a 4-quart saucepan, heat 2 cups of water over medium-low heat to simmer (do not boil). 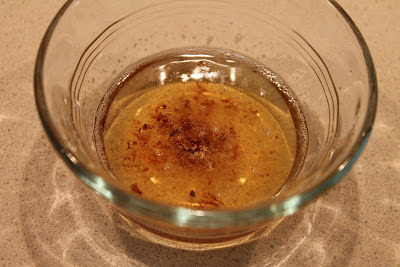 While water heats, add the crushed spices, salt, sugar, bay leaves, thyme, nutmeg, vanilla, garlic, tarragon, and honey. Stir until sugar and salt are dissolved. Allow to cool. Add lemon zest and juice. 3. Rinse the chicken and pat it dry. 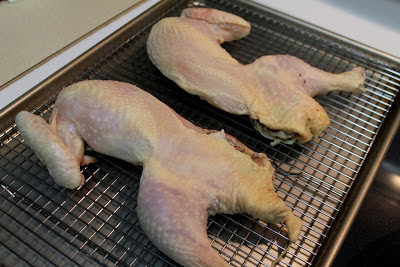 Cut the chicken in half by removing the backbone and cutting down the middle of the breastbone. Discard backbone and any included giblets (or use for something else). 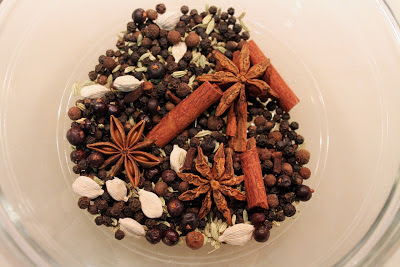 Combine cooled spice mixture in a large (2 ½ gallon) sealable bag with 3 quarts of cold water. Add chicken halves. 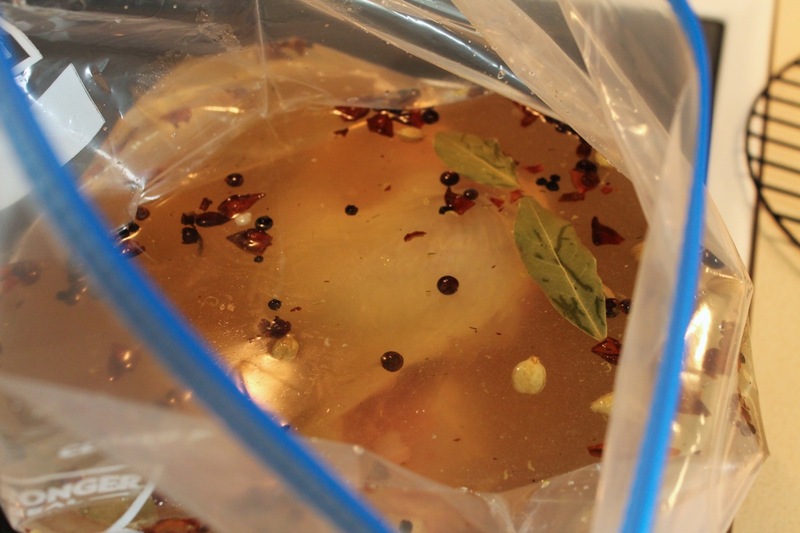 Seal bag and refrigerate to brine over night for about 20 hours. 4. Remove chicken from brine, rinse, pat dry with paper towels and place on a cooling rack set inside a baking sheet and place in the refrigerator to air dry for 6 hours. 5. Preheat oven to 450 F with rack in middle position. 6. Using your fingers, gently separate the skin from the breast meat, leaving it connected to form a large pocket. If you’re feeling confident, you can even reach in and separate the skin from the drumsticks. 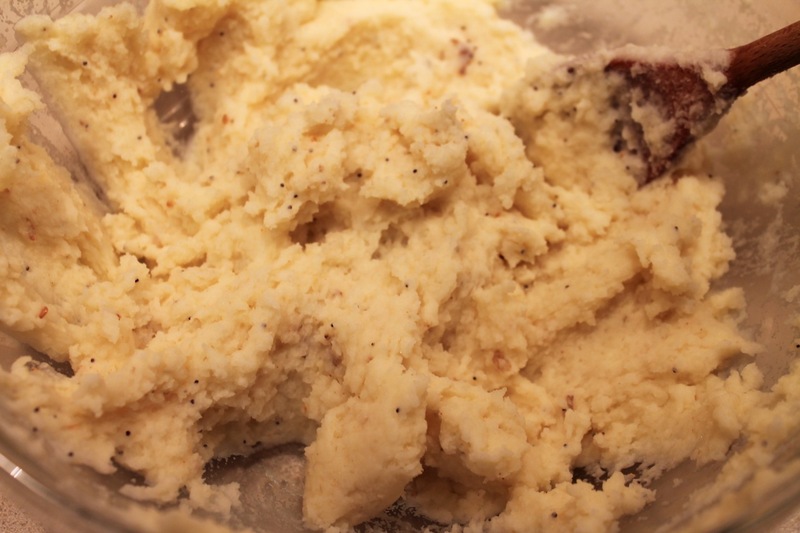 Use your fingers to smear truffle butter on the meat and move the skin back in place. Brush the outside of the skin with olive oil and season with salt and pepper. 7. 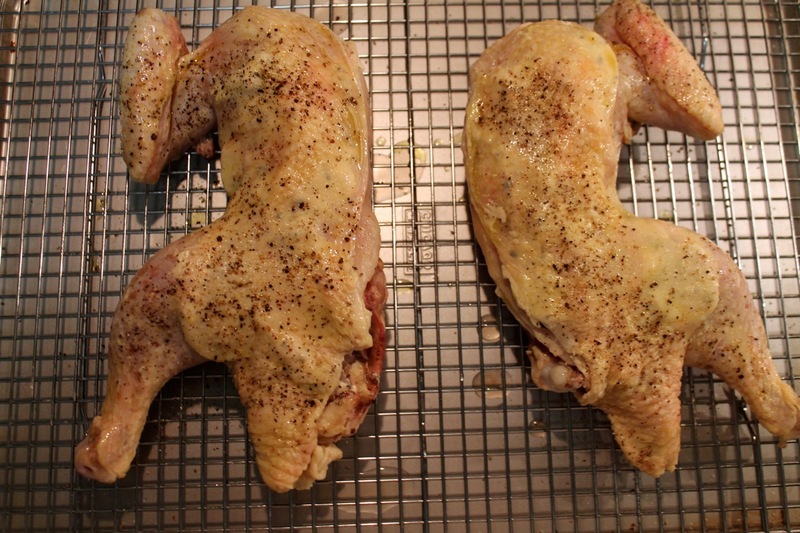 Place the chicken on the rack set in the baking sheet in the oven and roast for 20 minutes. Check chicken. If skin has browned sufficiently, cover with aluminum foil. If not, check again in 10 minutes and cover, if needed, to prevent burning. Reduce heat to 425 and continue roasting until instant-read thermometer reads 160-165 F, about 45 to 60 minutes total. 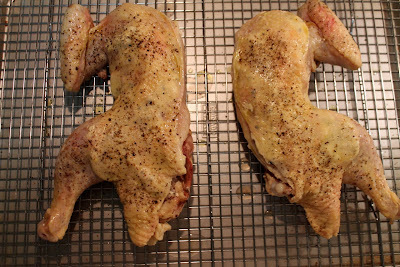 Remove chicken from oven. Serve on top of lemon-braised greens (recipe follows). It's always amazing how much greens reduce when they wilt. Remove chard stems and cut leaves in half to make two long halves, then chop across the leaves to make pieces about 1 ½ inches wide. Heat olive oil in a large sauté pan over medium heat. When hot, add chard and sauté until wilted, about 3-4 minutes. Season with salt, pepper and lemon zest as it cooks. Add chicken broth, cover and reduce heat to medium low. Simmer chard about 10 minutes. 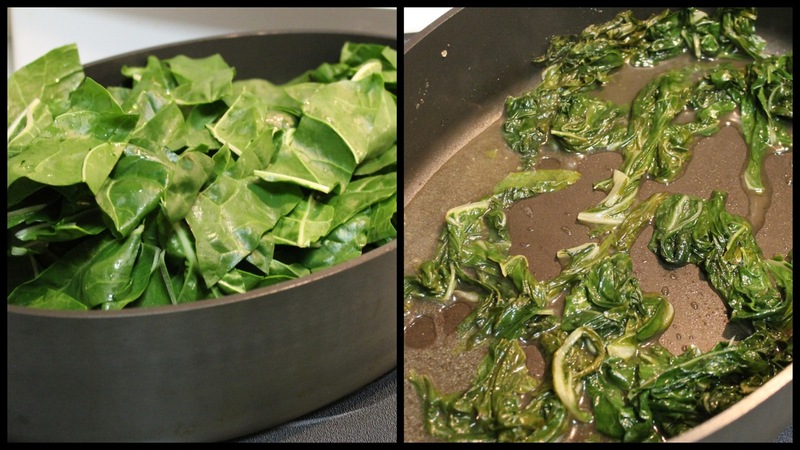 Remove lid, add lemon juice and continue cooking until the chard is tender, another 5 minutes. Remove with tongs or slotted spoon to leave excess moisture in pan. Drew Ramos, the bad-boy brother of Elena, hardly ever catches a break. John Ross is out to get him, and his sister, used to his shenanigans, views him with skepticism. But like Elena, Drew wants to make it in the oil business. He's determined to strike oil on the land their father once unsuccessfully drilled. 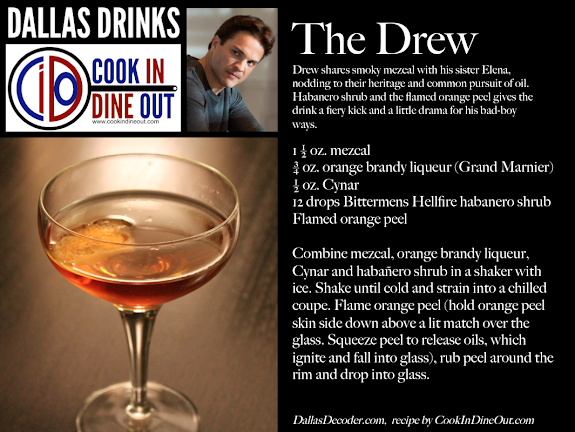 Like his oil-interested sibling's drink, The Drew features smoky mezcal but gets a fiery bad-boy kick from Bittermens Hellfire habanero shrub. Even more fire comes courtesy of the flamed orange peel, a garnish made by squeezing the oils from the orange peel over a lit match to ignite them as they drop into the drink. It's a dramatic flair worthy of the epic family drama of Dallas. 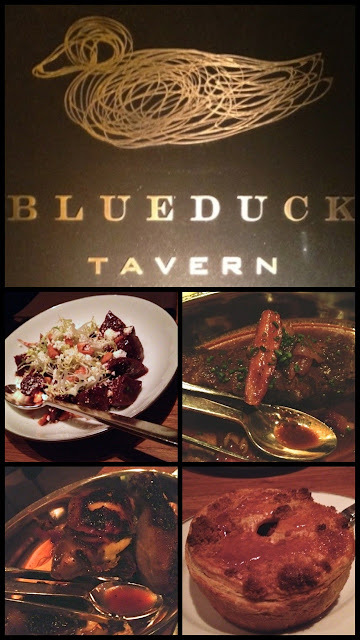 It took us a few tries to make it into Blue Duck Tavern, the handsome restaurant in the West End’s Park Hyatt hotel. We had reservations and then some friends we hadn’t seen for awhile wanted to hang out the same night. Of course we canceled, but it was another 6 weeks before I could get us in again at a reasonable hour on a Saturday night. This place is hot. That may seem surprising for a hotel restaurant that’s hardly “new”—it’s been open since 2006, having taken over the Park Hyatt restaurant space from the former Melrose. But tables here are as in demand as they are in the city’s buzzinest new joints. By all counts, credit goes to Chef Sebastien Archambault for pushing the cuisine to its buzz-heavy level since he began helming the kitchen in December 2011. The food was, appropriately, the star of our dinner. The braised beef rib was tender and bathed in a tangy house-made steak sauce. You’d be advised to squirrel away a couple pieces of the bread they bring early in the meal for sopping up this sauce. Roasted barbeque chicken was a delight. This isn’t barbecue joint chicken, but rather a bird brined in barbecue sauce ingredients and roasted to succulent perfection—its flesh a delightfully smooth texture underneath the flavorful, blistered skin. The barbecue flavor is subtly but not overpoweringly sweet. Like the ribs, it also comes with a special sauce made from collard greens and corn bread. The list of potato, grain and vegetable sides includes a variety of enticing options. The thick hand-cut BDT triple fries I saw on some tables looked tempting, and the forbidden rice with cauliflower, dried fruits, candied ginger and cherry vinaigrette sounds intriguing. We opted for the Brussels sprouts, which had a good char on their cut sides and were served with bacon, pecans and dried cranberries that added a nice sweetness to the dish. The starter selection includes soup of the day, salads, vegetable dishes, oysters, charcuterie and bone marrow. We opted for a warm leek salad served with generous chunks of guanciale and gribiche sauce, a hard-boiled egg dressing, and a beet salad with frisee and peanuts that had an unusually soft texture. “They’re fried,” confirmed our server, who took good care of us that night. With the exception of some initial confusion about where to go to be seated, the service worked well. Plate-clearing was efficient but never did they commit the sin of clearing Chris’s plate before I finished mine (I’m almost always the slower eater). The setting fits the food perfectly. Low, warm lights, large glass windows, lots of natural wood and some old-fashioned wall quilts speak to the rustic but upscale American cooking coming from the kitchen. Speaking of which, the large open kitchen is perhaps the tavern’s most arresting visual element. It’s so open that a trip to the restroom means snaking through the pastry kitchen. To finish, we had to have the apple pie, which Blue Duck Tavern considers its signature dish. It was quite good, although it wasn’t as spectacular as I’d hoped, ever the folly of great expectations. The generous portion, perfect for sharing, is architecturally structured with straight up-and-down sides and a fitted top like a little apple pie hut, which was clever looking but fell apart pretty easily. 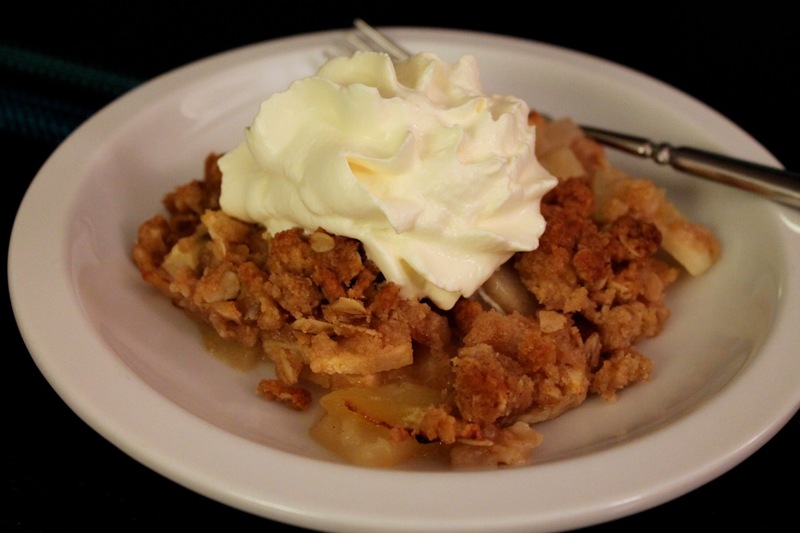 The apples had a good texture and were well spiced, but I thought the crust was surprisingly dry. Good thing we ordered it with a scoop of honey-vanilla ice cream, which was delicious. It’s a shame the pie didn’t perform as expected since pastry chef Peter Brett had his last day at Blue Duck Tavern yesterday, and now I won’t have a second chance to sample his work. If I had one gripe about our dinner, it has to do with the food. Not the food itself, which as I said earlier was excellent, but how it was served. As is the trend, dishes at Blue Duck Tavern, very similar to the service at Range (in fact, there are a lot of similarities between the two restaurants). However, these dishes are so well composed and garnished with amazing sauces that I think they would be better served as individual portions. Throughout dinner I felt like I was dodging my wine and water glasses trying to get a little more sauce and more than once I knocked the serving tongs into said sauce. I’d love to see the kitchen do the plating instead of leaving it to me. I’m sure it would look even better that way. With spring fast approaching, I’d be curious to go back soon and see how the menu changes with the seasons. That is, if I could get a reservation. Better book now for late April. Blue Duck Tavern, 1201 24th Street, NW (at M Street), Washington, D.C. (West End). (202) 419-6755. Reservations: Open Table. Does meat belong in a cocktail? I suppose it may, depending on your feelings about all things experimental going on in the world of mixology these days. The Washington City Paper recently catalogued six examples of D.C. restaurants that have found ways to incorporate meats like foie gras, pork belly and venison in drinks. I’ve had the Vegan Sacrifice cocktail at Range, which uses frozen veal consommé as its ice cubes. For my bacon week, I thought why not give it a try. Of the meat cocktail ingredients I’ve heard of, bacon-infused bourbon seemed the simplest to try. After having successfully infused rye whiskey with peanuts last year, I thought it was time to try another infusion experiment. Directions for making bacon-infused bourbon are easy to find on the internet and they all do basically the same thing: cook bacon to render bacon fat, mix the bacon fat with bourbon, freeze overnight to infuse, strain out the solidified fat. Doesn’t sound too hard. I used 1 oz. 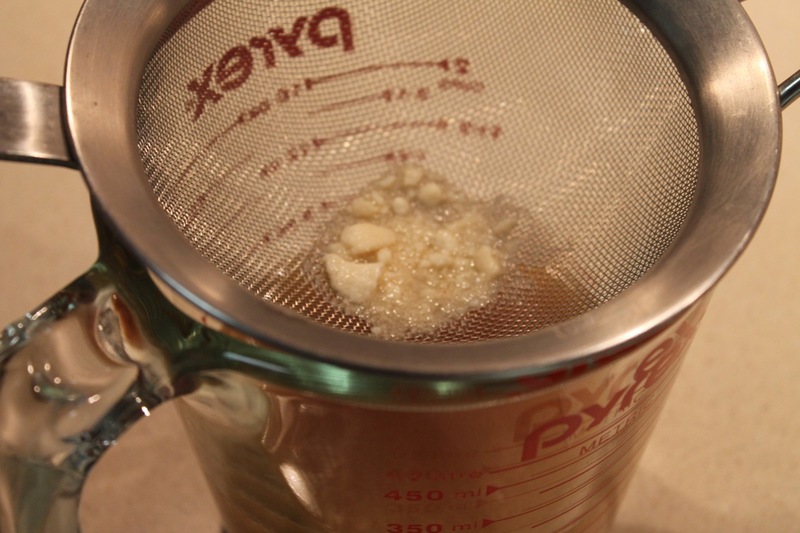 of bacon fat to infuse 8 oz. of bourbon, which resulted in almost 7 oz. 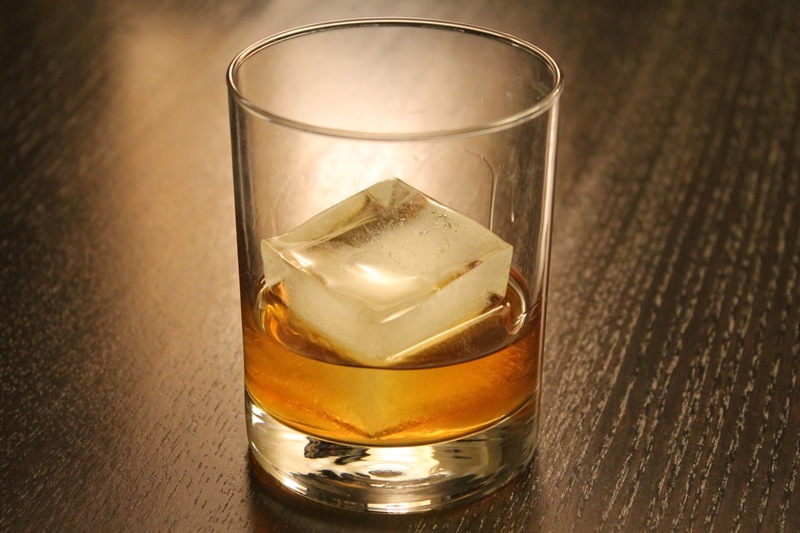 of bacon-infused bourbon. The solidified bacon fat formed a thin layer on top of the bourbon that I had to punch through to get to the liquor. And straining the mixture through a coffee filter took quite awhile, so be patient. The results were not as bacon-y as I’d hoped but not bad. 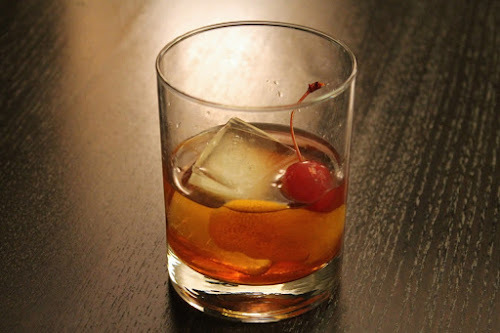 We sampled the bourbon straight and then used it to make old fashioneds. We thought the bacon flavor was actually more pronounced in the cocktails, perhaps brought out by the sweetness of the maple syrup? 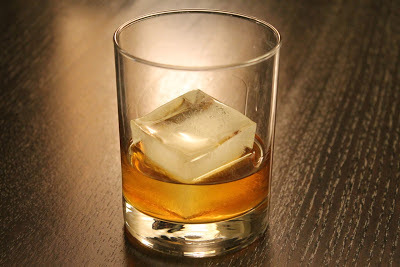 Combine bourbon, maple syrup and angostura bitters in an old fashioned (rocks) glass with ice. Stir until combined and chilled. Squeeze orange peel to release oils over drink and drop in. Garnish with cherry. Cook bacon until crisp. 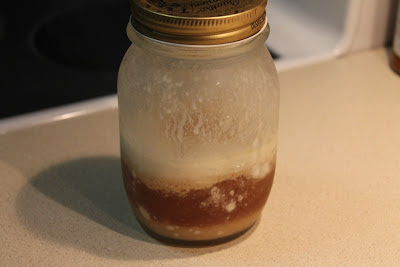 Pour the rendered bacon fat into a glass container and allow to cool but not harden. Use the bacon for something else (maybe just eat it). Combine the bacon fat with the bourbon in a sealable container, such as a jar. Give it a good shake and put it in the freezer to infuse overnight. Pour the mixture through a mesh sieve to remove large pieces of solidified bacon fat (discard fat solids). 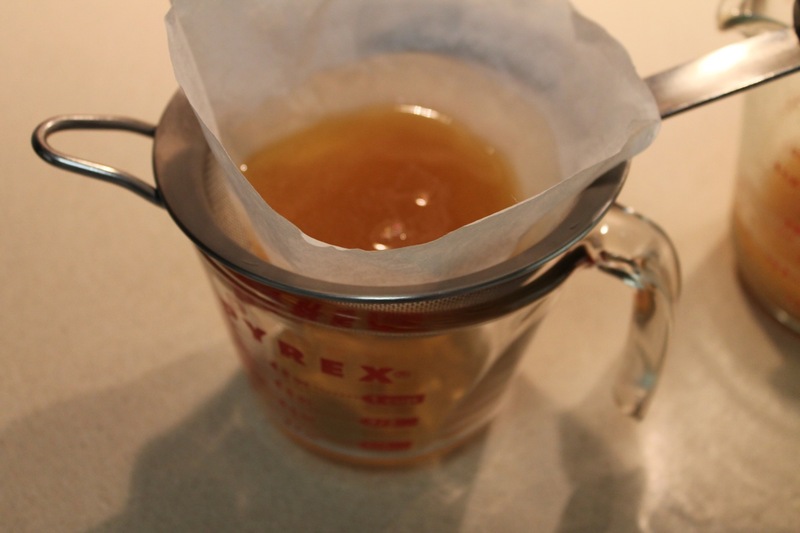 Pour the mixure through a coffee filter (I recommend doing this in two steps, as it can take awhile and you may need to use two filters).